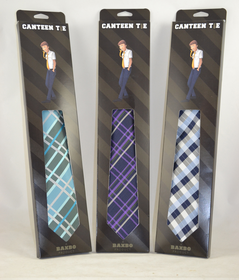 A Canteen Tie is a perfect antidote for those dry formal functions you are forced to attend. Stitched into each tie is a re-fillable 8 oz. pouch you can fill with the liquid of your choice. The pouch is undetectable and invisible to others, but you’ll be able to enjoy a sip from your tie when things are dull. These hidden flask ties are more than a gimmick. With fashionable designs made of a silk and microfiber blend, you’ll be wearing a stylish tie that’s durable and won’t wrinkle easily or bleed onto your clothing. Pillow Ties feature a hidden inflatable pouch inside the bottom of the tie that inflates, allowing you to rest on your inflatable pillow tie on a plane or during a boring meeting. Pillow Ties make great gifts for any guy, even the one who already owns dozens of ties because this one will be unlike any other selection in his collection. These novelty neckties are fun, hilarious, and practical. The makers of these novelty ties believe that "most functions that require a necktie deserve to be slept through."